Long-lasting premium porcelain magnetic whiteboard with flipchart pad holder is the perfect tool for presentations and meetings. 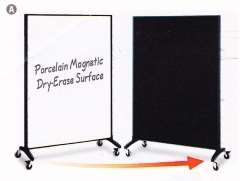 Durable fabric bulletin surface on reverse side allows presenter to display items. Updated design with graphite metal frame. Sleek narrow footprint and easy mobility with four modern design wheels, two locking. Includes four Quartet markers, eraser and attachable marker tray. 48x72, Graphite, 88 lbs.